Four pools, five whirlpool spas, a name inspired by the waves—we have a certain infatuation with water. Inside, The Breakers stuns with its blend of old and new—historic architecture modernized with finesse. Outside, our resort captures the splendor of Palm Beach with equal measure. Stroll down the Ponce Promenade, past the Ocean Lawn, and enter The Beach Club—a private outdoor oasis: a series of four glittering pools, dotted by restaurants, bars, chaise lounges and chic bungalows. Up for an adventure? Each day, The Breakers’ private half mile of beach acts as a playground for a long list of watersports. Gather there to embark on an exciting scuba or snorkeling tour, taking you under the sea to explore the reefs and marine life that lie just beyond The Breakers’ back door. For scenery above the water’s surface, try kayaking, paddle boarding or a ride on the resort’s Hobie Cat. And for an adventure on the Atlantic that’s decidedly relaxed, opt for a sunset Catamaran Cruise—the most glamorous way to see Palm Beach. To partake in the fun, start by viewing our watersports activities. To learn more about details, experience levels, pricing and reservations, simply call: (561) 659 8497. The ultimate in luxury? A private poolside oasis. 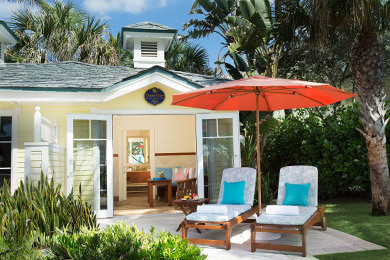 Take a break from the sun in one of our elegant, indoor-outdoor bungalows, set along the perimeter of our pools. Each is outfitted with plush furniture, a flatscreen TV, bathroom, exclusive food and beverage service, and much more. For additional details, daily rental fees and reservations, simply call [NAVIS: (877) 724-3188].